Is what I keep telling myself as I enter what feels like the same instructions over and over and over again. Recipe writing is boring. Recipe creation? Fantabulous fun! Writing out each step so anyone can understand it? Not so much. Not everyone would necessarily grok it and, well, I really want this book to be accessible. It would require all sorts of formatting hijinks to work with the pre-scaled ingredient lists. Folks aren’t going to be reading the recipes like a page-turner. Just because *I* have been known to read a cookbook like a novel doesn’t mean most people do this. And folks aren’t necessarily going to cook their way through the book from start to finish, picking up skills and syntax as they go. No, you’re going to flip through and see something that catches your eye (or find it in the index–oh, the index, that’s a whole ‘nother whinge session) and make it. 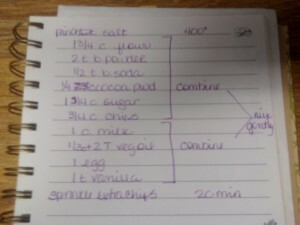 So that recipe has to have just the same amount of detail and the first one. But, oh, is it dreadful to actually have to write. I’m about 3/5 through the data entry portion and, really, it’s the procedure bits that are taking so long. Sure, I could skip that part and just enter the ingredients and run the nutritional numbers and write the process later but I’d still have to write it. And this way I get to get the basics down as my sucky “first draft” and polish it up when I export the file from the recipe software to a Word-like document, edit my little heart (and soul) out, and then import the salient bits into Scribus (open source for the win, folks) for the final layout bits. And my oven is still dead.